sammson.com - Home of Jason T. Justice since 1998! 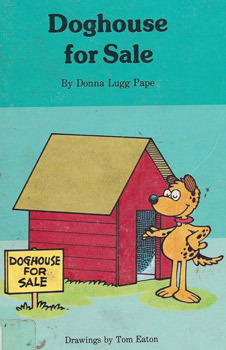 One of my favorite childhood books was Doghouse For Sale by Donna Lugg Pape and Tom Eaton. Spoilers for the story follow, but they are for a purpose and you will still want to experience this book for yourself, trust me. In the book, our hero, Freckles decides he's tired of the same ol' 4 walls and puts his house on the market. He gets a lot of looks but nobody wants to buy the house. One by one, potential buyers tell him what shabby thing about his homestead he could fix up to make it more appealing. He does this and after several improvements, and also, presumably, racking up quite a tab at Dog House Depot, Freckles decides that his house is so awesome, he's just going to keep it. Freckles' story is also my story. I tried to sell this domain, thinking it might fetch a decent price, but nobody wanted to buy it. So I got to thinking and like Freckles, I decided this old home (page) was part of who I am. So here I shall stay. And also like Freckles, I will be sprucing this place up. Stay tuned! Live reasonably close to the Flint, MI area and looking for a great Christian school for your K-12 children? Try Waterbrook Christian Academy!